It's Saturday! As we often exclaim to the kids, "It's Happy Family Day!" I don't know about you, but I have some fabulous plans for today that don't involve cleaning. Let's get the show on the road, so we can enjoy the day! Unfortunately sweet Caleb seems to have picked up a tummy bug, so some of our fabulous plans won't be happening. I'll be able to enjoy lots of baby snuggles though. Throw in one load of laundry that you can dry, fold, and put away at some point during the day. Make the beds. 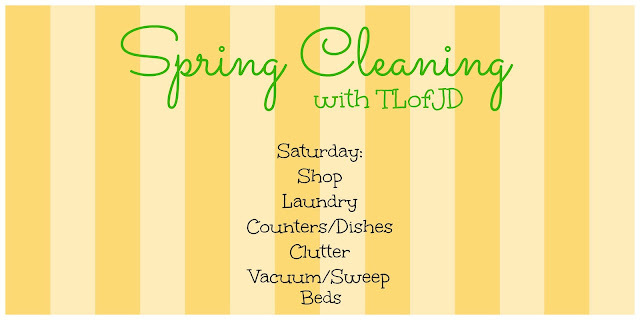 Wash the dishes and spot clean the floors as needed. Grab the grocery list that you put together when you menu planned yesterday. Pick up the groceries you'll need for the week at some point during your fabulous day. I like to do a quick clean on the refrigerator before putting new groceries away. I throw things out that need to be tossed and wipe the inside of the refrigerator clean with Clorox wipes. Your food is going in there...you want it to be clean. Towards the end of the day, you can finish that load of laundry, pick up any clutter (which should be very little if you spent your day out and about), and give the kitchen counters a quick clean.